The goal of this tutorial is to illustrate in detail about how to integrate OpenCV into UE 4.17 using the Visual Studio 2017. This tutorial is mainly based on the great tutorial of Ginku. I wrote this because I want to give some help to newbies like me, who have difficulty following Ginku's tutorial, and those who want to integrate OpenCV into UE 4.17 using Visual Studio 2017. Also, this tutorial can be useful to those who want to add more functions using OpenCV. I strongly recommend you to read my previous tutorial about linking static library to UE4 because it offers an insight into the integration of external library into UE4. Also, my previous tutorial deals with many errors you might face, which can be helpful. Caution: To follow this tutorial, please use OpenCV 3.2.0 and UE4.17 and VS2017. UE4.17 supports VS2017. The version number of VS2017 is VC15. OpenCV 3.2.0 is compiled with VC14, which is binary-compatible with VC15. Therefore, using other versions of OpenCV, Unreal Engine or Visual Studio might cause error. Before you continue, make sure you are starting from a code project. Go start your UE4 launcher. In your project browser, click new project and select C++ tab. Choose the basic code template. Name your project CV1. Now generate the project. When your project opens up, go to content browser and right-click the mouse, select new c++ class. An window will open up. Choose Actor as parent class. Name the Actor as 'MyActor'. Unreal Engine will create Binaries folder in your project folder automatically. Click here and download OpenCV 3.2.0. I'm using Windows operating system, so I chose Win pack. Extract the compressed OpenCV file to wherever you want. I did it on my C drive. Inside the OpenCV install directory you will find the ‘/build/include’ directory. Copy all of the contents of this directory into the ‘[UE4 ProjectRootDirectory]/ThirdParty/OpenCV/Includes’ directory. Caution: You don't have ThirParty folder by default. So you should create the folders needed by yourself. Next, copy the 'opencv_world320.dll' and 'opencv_ffmpeg320_64.dll' files in the ‘/build/x64/vc14/bin’ folder and the 'opencv_world320.lib', files in the ‘/build/x64/vc14/lib’ folder to the ‘[ProjectRootDirectory]/ThirdParty/OpenCV/Libraries/Win64/’ directory. Note: This process is similar for any version of OpenCV or any third party library. You only need the runtime libraries (not the debug ones with a 'd' appended, such as 'opencv_world320d.dll' unless you need the debug versions). Locate and open your projects module rules file, which should be in your projects ‘Source/[Project Name]’ directory. (It will be in the format of ProjectName.Build.cs) In this file, we will add the necessary code so that the unreal build tool will include all of the necessary dependencies during build time. This lets you use the Path helper class, which is very useful for assembling directory paths! // Start OpenCV linking here! Be sure to add the InputCore, RHI, and RenderCore engine modules to the public dependency list, we will use these later to create a dynamic texture from the camera feed. The PrivateIncludePaths will allow you to include the OpenCV header files without full paths. Right-click your project on your solution explorer, click Debug - Start new instance. Now, your project should successfully compile with OpenCV included within the engine build! However, there is one more thing that needs to be included before you can use OpenCV's function inside your UE4 editor. Caution: If your build fails with 'cannot open opencv_world320.lib' error, please make sure that you have made correct folder structure and included all the header files and library files as I mentioned above. In my case, I forgot to make 'Win64' folder under the 'Libraries' folder. After I created 'Win64' folder under 'Libraries' folder and included all the dlls and libs, I was able to solve my problem. This stage is very important! So don't forget to follow this stage, unless you can't make your UE4 work with OpenCV. Before your project will run with any OpenCV code, you will first need to add all of the dynamically linked library (.dll) files that you use to your editor’s bin folder. Your editor will typically be a 64-bit application, so copy all of the .dll files (opencv_world320.dll and opencv_ffmpeg320_64.dll) from the OpenCV’s 64 bit bin folder (full directory shown above) and paste them inside the ‘[ProjectRootDirectory]/Binaries/Win64’ directory. Note: These DLL's should also be included with any distributions of the project (such as when packaging your game/project), by including them in the same directory as the project's executable (MY_PROJECT.exe). There is a collision between the OpenCV3 library and UE4. To fix this, comment out lines ~51 to ~55 and line ~852 of the utility.hpp header file in the '[ProjectRootDirectory]\ThirdParty\OpenCV\Includes\opencv2\core' directory. //#  warning Detected Apple 'check' macro definition, it can cause build conflicts. Please, include this header before any Apple headers. Open your Project Properties and go to Configuration Properties -> VC++ Directories section. Add ..\..\ThirdParty\OpenCV\Includes to Include Directories tab. #include "CV1.h" //don't forget to include this! // TODO: Do any processing with frame here! Note: If your project name is different from me (CV1), you need to change CV1 in the class definition of the header file and the project include in the source file with the your project name. This class is used as a wrapper for a future unreal blueprint class. It allows you to specify the device ID, target resolution and framerate of the camera, as well as providing a dynamic texture and FColor array of the current frame's pixels and a blueprint native event that is called whenever the next webcam frame is available! You can now access your webcam feed in blueprints. From this point forward we will be working in the editor. Now that all the code has been included for accessing your webcams, I will now show you how to use the dynamic texture from the WebcamReader actor in a new WebcamBillboard subclass. This time, the code will be implemented in unreal blueprints! Launch the editor again with Debug > Start new instance. In your choice of directory, right click and add a new blueprint class. At the bottom of the new window, expand ‘All Classes’ and search AWebcamReader and select it as the parent class. Name the new blueprint BP_WebcamBillboard and open it. Within the viewport, add a cube static mesh component, and name it Billboard. This will be the component that the texture is rendered to. At the beginning of the game, we will want to create a dynamic material instance and set it to the billboard mesh. Under Variables, click the + button to add a new Material Instance Dynamic type variable. Name the variable as DynamicMaterial. Drag the Billboard component onto the Event Graph, and create a getter node. Drag out from this new getter and create a Create Dynamic Material Instance node and connect the white execution wire to the transparent BeginPlay event (or create one). 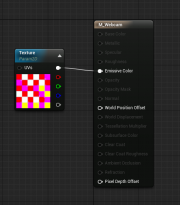 This creates an special unreal material instance that can be altered at runtime. However, we have not created this unreal material! Go back to your content browser, right click and create a new material. Call this material M_Webcam and open it. Click on the M_Webcam node and set the Shading Mode to Unlit. Hold T and left click anywhere in the new graph to create a texture node. You will have to set the default texture to anything (I used T_Ceramic_Tile_M). Right click this node and convert it to a parameter. Call this parameter Texture and connect its white Float3 pin to the Emissive Color pin on the M_Webcam node. Make sure the save the material! Now, back in the BP_WebcamBillboard blueprint, select the M_Webcam as the Source Material for the Create Dynamic Material Instance node, and make sure the Element Index is set to 0. Drag out from the original billboard getter and create a Set Material node. Set the Material pin to the output of the Create Dynamic Material Instance node, and again make sure the Element Index is set to 0. Finally, drag out the DynamicMaterial variable we created earlier and create a setter. 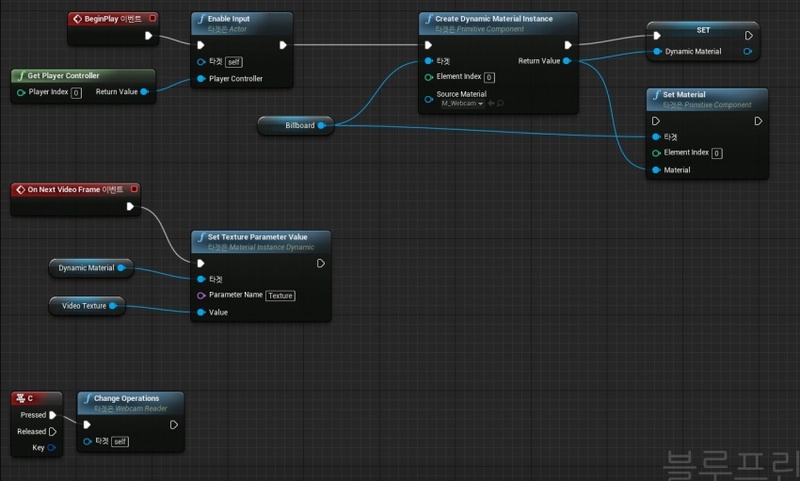 Connect the output of the Create Dynamic Material Instance node to the DynamicMaterial input pin to save a reference of this special material for later use. We have dynamically set the material of our Billboard mesh, and now we need to update its texture parameter each time a new frame is received. To do this, right click on the Event Graph and create a OnNextVideoFrame event. This event is called in the WebcamReader actor whenever a new frame is read. Drag out the DynamicMaterial variable and create a getter underneath the new event. Drag out from the getter and create a Set Texture Parameter Value node. Set the Parameter Name to Texture (the name of the texture parameter in the M_Webcam material). Right click on the Event Graph and type VideoTexture to retrieve a reference to the webcam texture provided by the WebcamReader parent class. Connect the output pin of this VideoTexture reference to the Value pin of the Set Texture Parameter Value node. With that, the BP_WebcamBillboard is ready for use! Drag the BP_WebcamBillboard blueprint from the content browser into your level. Orientate and position it however you like, and scale it to a similar scale of your images resolution (about 6.4, 4.8, and 0.5 for my webcam). Now, set the Webcam properties in the detail panel. (I used a Camera ID of 0, Should Resize to false, and Refresh Rate of 2.0) Your Camera ID will determine the camera that renders, it should be 0 unless you have more than one webcam. In the case of a laptop, 0 will probably be the integrated laptop, and 1+ will be any additional webcams. You can now press play to see the results! Now I am going to add more features to the Blueprint. I want to apply an operation to the video frame, and change the operation to another one whenever I press the 'C' key. Open BP_WebcamBillboard editor window again. Right click the editor window, search for Enable Input and create the node by click it. This time, right click the editor window, search for Get Player Controller and add the node by click it. Modify the existing connection to BeginPlay node as the picture. Now we can get any input from player! Right click the editor window, search for input c and create the node by click it. Right click the editor window again, search for Change Operations and add the node by click it. Connect the two node following the picture below. The finished state of your BP_WebcamBillboard should be the same as the following picture. Everything is ready. Click Compile and then Save your blueprint. We finished adding new feature to our blueprint! Let's start using this newly added function from now on. Click the Play button on your UE4 editor. Press C key. Everytime you press your C key, you can see that different operations (default, median filter, Canny edge detection) are applied to your webcam billboard:) I also uploaded the result video below. Enjoy it! You have finished your long journey. Congratulations. You will be able to integrate OpenCV into UE4 and use functions of OpenCV inside UE4 as you wish. You can read more about me on my User Page. Have a nice day :).